Mmm ... that peanut butter chocolate cake sounds gooooood, Louise! Love the taste of vanilla and butter in a cake...if it's not with the taste of lemon or orange (especially for a topping). I find I have to ration your delectable desserts, Jean. They are all too too tempting. I do have my favorites that are posted on the side of my refrigerator. Truth is I can't keep up with all the recipes I want to try that you so beautifully present. Aaw, Sue, thank you so much! I can't eat too much dessert myself, so I give my husband and guests huge servings of it to spare myself! You can't never go wrong with the combo of vanilla and butter..your one bowl cake looks very beautiful, Jean. Thanks, Angie! Sometimes I don't bother to get out the piping bag, just slap on some frosting! Thanks for this recipe. I love any icing but caramel is my fav. Mildred, I agree - caramel! Deb, that's one combination I've never had! I love spice cake but always have it with a vanilla frosting of some sort. Must try it with chocolate some time! It’s baaaa-ack. You may call that chocolate frosting, but it’s pretty close to last week’s caramel – and we know what that did to my dormant taste buds. There is something in the texture this week that awakens the same responses. I can taste certain gritty sugar bursts therein. 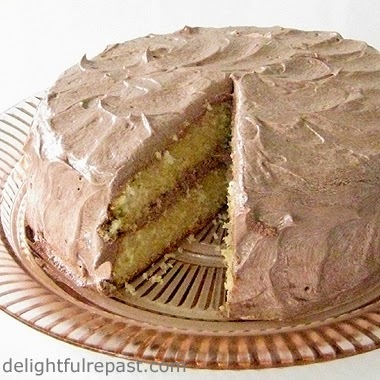 Yellowcake – eh – but the frosting gets me every time. I think you found yet another preeminent laurel in your collection. Put frosting on everything (even veggies), and I’ll go the whole 9 yards toward a balanced diet. He said. 5 cleavers! Whew! Another 5 cleavers! I'm overwhelmed. And I must say this chocolate frosting is very tasty (and I'm not even a chocolate fan). But it's the eh-to-you yellow cake I really like. Right, Amy! A bit of cake and a nice cuppa tea! Well I'm not much on baking so I'm not leaving a comment about cake here. Instead...I was looking back at some of your recipes and see my all time favorite ~ Chicken Tikka Masala. I love it so much I always say I could drink it. My ex-husband was British and we ate at Indian restaurants whenever we could find one. YUM! Pat, thank you! I wish *I* wasn't interested in cake! LOL But I do believe I like chicken tikka masala even more. I hope you'll give my recipe a try and let me know how you like it. Love one bowl cakes, and peanut butter chocolate sounds wonderful. I also love the taste of vanilla and who doesn't love butter. Thanks for stopping by and letting me know you liked my new cabinet in the corner of my kitchen! Nicole, thank you so much! And I'll be visiting your blog often for gardening inspiration! Cathy, thank you! And, yes, I did love that cabinet - so perfect for your 1929 charmer! Pat, that's great! That would be soooo fun! I found the baking powder to be a bit much and could taste is, but only very slightly. However the general flavor and sponginess is excellent and the amount of vanilla is just right. Thanks, B! Interesting about the baking powder; I wonder if the brand makes a difference. Thanks very much for this recipe. I'll definitely be making this cake. However, I can't seem to find the Caramel Flour Frosting recipe. Any help would be appreciated. Keith, here's my Caramel Flour Frosting - http://www.delightfulrepast.com/2014/06/caramel-frosting-variation-on-old.html - Do let me know how the cake turns out for you! Well, if it had been the proverbial snake . . . please ignire my previous request. I found the Caramel Flour Frosting recipe right under my nose. I'll be trying the yellow cake and this frosting. I sure do thank you a lot for the recipes. Keith, you are so welcome. Can't wait to hear how it turns out!